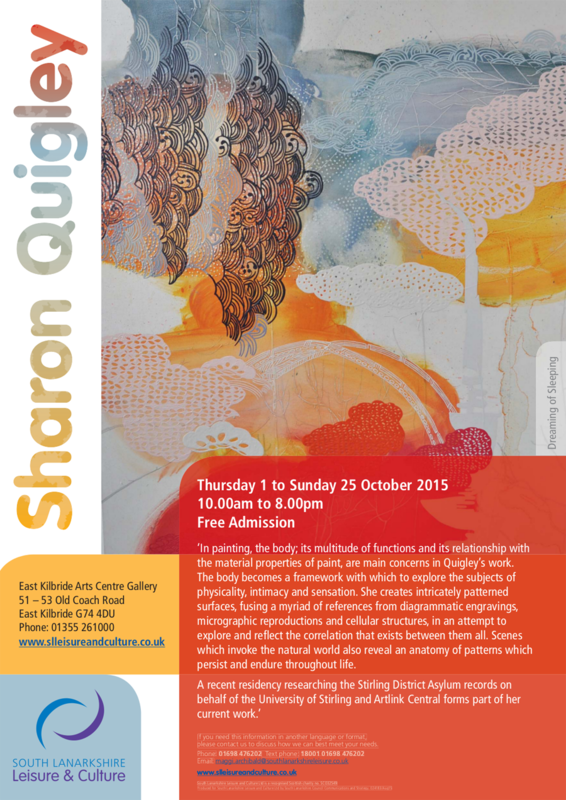 If you happen to be passing through East Kilbride, please drop into the East Kilbride Art Centre. This exhibition includes new visual artworks and sound works. ‘Staring at the Ceiling Looking at the Stars’ and ‘Mrs Rob’s Conversation’, inspired by a recent residency within the University of Stirling’s Archive Department, researching the historic records of Stirling District Asylum. These pieces were created collaboratively with sound artist Robert Baldock, patients and staff at Bellsdyke Hospital, Stenhousemuir, Central Scotland. More work from Staring at the Ceiling Looking at the Stars can be viewed in full at NHS Forth Valley Royal Hospital, Larbert and was created in partnership with the University of Stirling’s Art Collection and Archive which houses NHS Forth Valley’s archive. This project was produced by Artlink Central, the participatory arts organisation involving patients in high quality creative art and design activity.